Whenever someone asks me what’s the best whitening lotion, best whitening moisturizer, or anti-aging cream, I always have the same response. 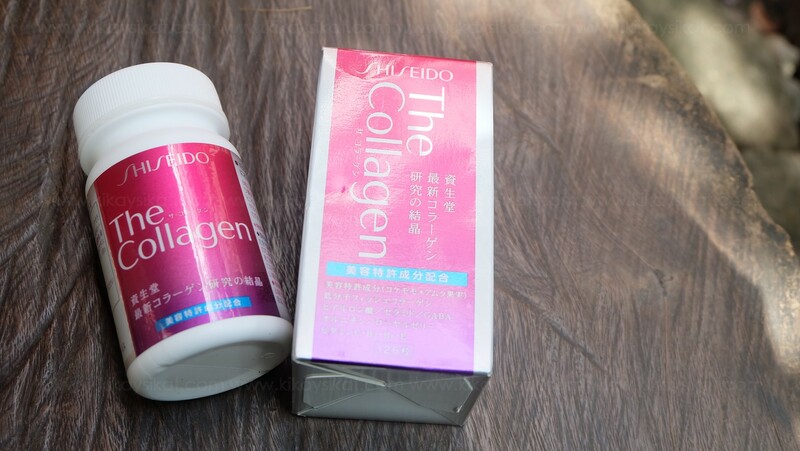 The best all around cream for “whitening” and anti-aging is no other than SUNBLOCKS. 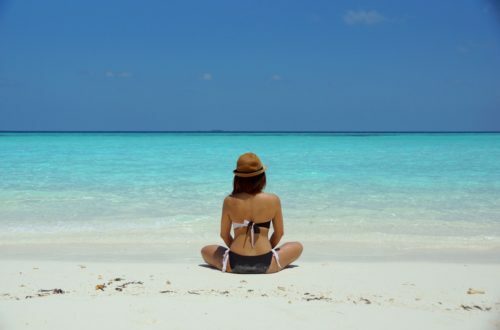 The suns UV rays are the top culprits in causing premature skin aging and skin darkenning, besides giving us cancer. 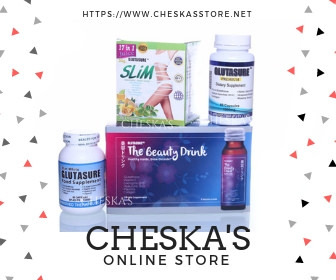 Most whitening lotions in the market only provide temporary skin lightening with the high amount of titanium dioxide in their ingredients list that gives the illusion of “fair skin”. 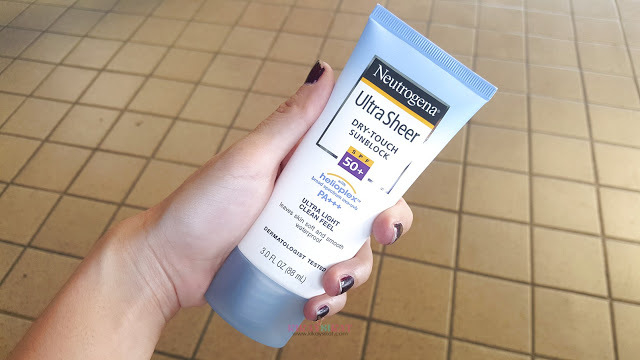 I’m a forever fan of sunscreens and will always be on the look out for the best so when I ran out of my Biore UV Aqua Rich Watery Essence which a favorite of mine because it’s refreshing and highly recommended for oily skin; I immediately head off to Watson’s and try out a new one. I’ve heard rave reviews for this product so it came next to my list. 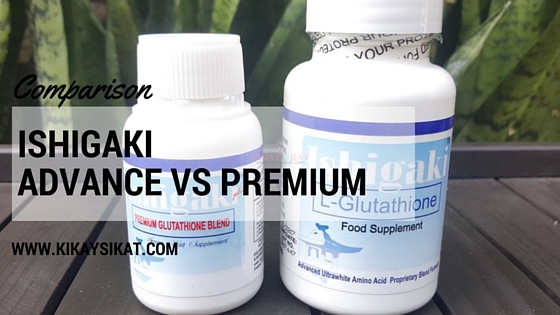 Continue reading until the end of the post for the product, description, and my full review! 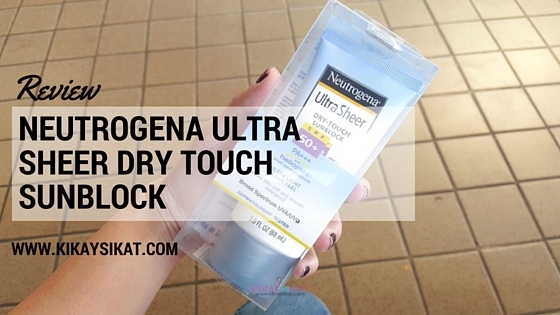 Neutrogena Ultra Sheer Dry Touch Sunblock SPF50+ PA+++ is a breakthrough in sun protection. 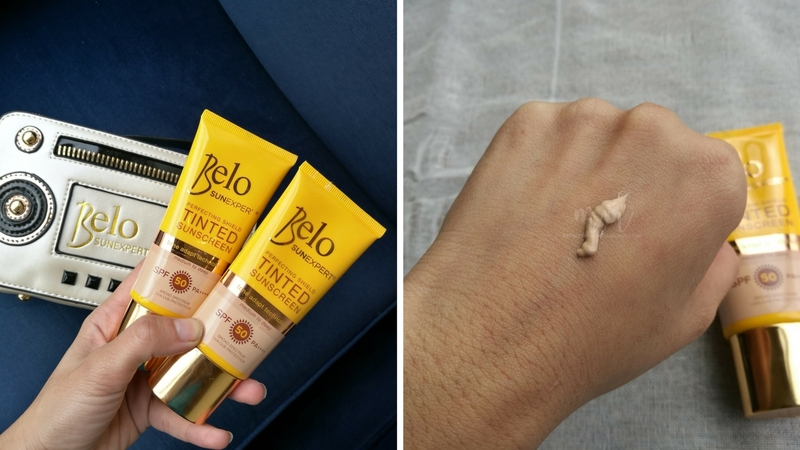 Stabilized with Helioplex, it provides superior balanced broad-spectrum protection against skin-aging UVA and burning UVB rays, and combines it with Dry Touch Technology for an ultra-light, non-shiny finish. 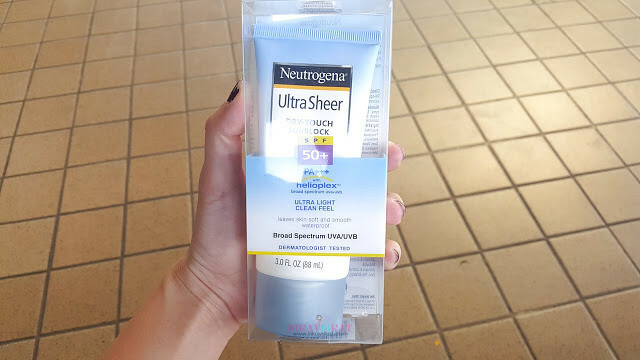 This lightweight sunblock has a light fresh scent and is gentle enough even for sensitive skin. I’ve been using this everyday since I purchased it because I want to empty it already. Why? Because I still prefer Biore UV Aqua sunblock. 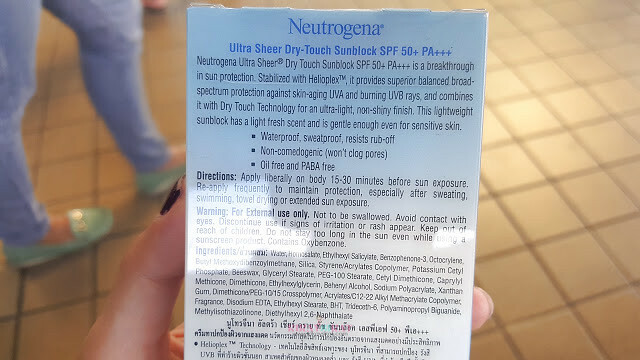 I find this sunblock to be really thick in texture and challenging to spread on the skin. However, once dry it’s barely noticeable and soft to touch. True to it’s Dry Touch claims. Apply liberally on face/body 15-30 minutes before sun exposure. Re-apply frequently to maintain protection especially after sweating, swimming, towel drying or extended sun exposure. Packaging – It comes in a big plastic tube with a rubbery feel. This is perfect if you’re swimming because it won’t easily slip your grip. Texture – While it is a challenge to blend and spread out, it dries sheer and dry much like its claims. you barely notice it’s there. It’s best if you squeeze out a lot of product so it’s easier to spread out. Scent – It smells like the beach. Does it work? 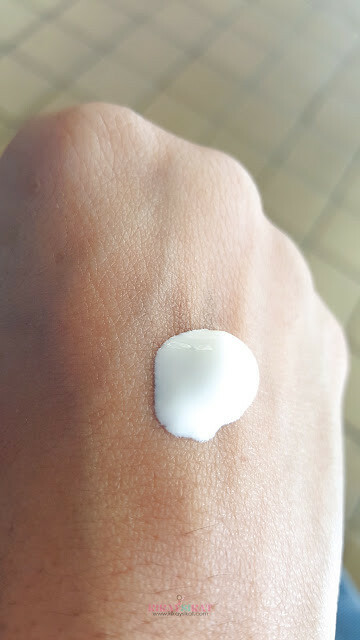 YES but Biore UV Aqua Sunblock is so much better in terms of texture and spreadability. 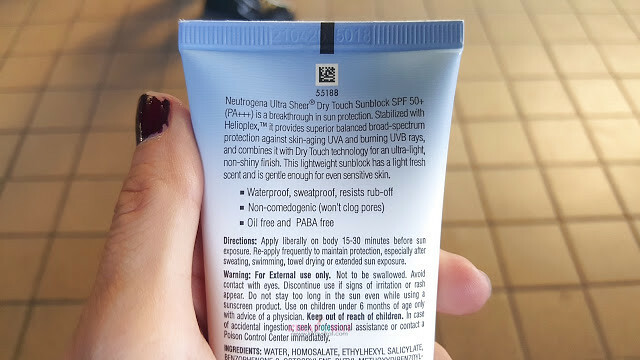 Final Thoughts – It has high SPF, did not break me out (non comedogenic/does not clog pores) and did not sting my eye even if I rub it accidentaly (most sunscreens do this).I recommend this for moms and babies! Since it doesn’t sting and feels light and comfortable on skin. However, I find the texture too thick for my liking. I will finish my tube but I am not purchasing this again soon.